When you start getting tired of the same old stuff on the radio, you start looking for those artists that could easily have their songs played on the radio if the industry wasn’t so set in their ways of promoting the same tired artists. One particular artist that should be making a lot more noise in the music industry right now is San Francisco singer-songwriter Megan Slankard. Megan Slankard had been making music for the better part of a decade, during which she has self-released four CDs of original music, the last of which, A Little Extra Sun, was released back in 2005. The latest release from Megan Slankard is the 2011 album A Token of the Wreckage. A Token of the Wreckage from Megan Slankard is one of the albums that once you hear it, you can’t believe that you’ve never heard of the artist before. The twelve song release from Slankard is as good as anything that the major labels have released in the last ten years or so. To help create her latest album, Slankard is joined by multi-instrumentalist Danny Blau who added guitars, keys and other instruments to the album; guitarist James Deprato; bassist Jeff Symonds; drummer Kyle Caprista; as well as producer Jerry Becker and mixer Dave Bryson, who each added much more than their technical expertise to the album, as they both contributed musical talent, as well. The newest release from Megan Slankard begins with the title track of the album. 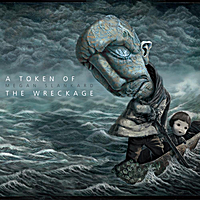 “A Token of the Wreckage” is a solid song that features a slow but strong spirit in its music. The quiet keyboards that lead into the song help give the album a great starting point. Slankard and the band create a song that has a lot of energy, despite the slow tempo. While the song does go over five minutes, it is also one of the best tracks on the release. The four-minute playing time for the track “Fair Enough and Farewell” makes it a lot easier to promote the second song of the release as a single. To go along with the much more commercial length, the song contains of strong commercial Pop feel to the music. The Pop-Rock feel of the track and the beautiful vocals of Slankard make the track one of the commercial of the album, and one of the best songs from 2011. After the first two songs on the newest album from Megan Slankard turned out to be so strong, it’s such a pleasant surprise that the album doesn’t slow down with the third track. But “Our Little Secret” is a track that will surprise you with how strong and listener-friendly it actually is. In fact, everyone involved in the entire production of the track gives the song so much commercial appeal that “Our Little Secret” is a song that has that type of feel to it that almost definitely screams “single”. It is on the fourth song that the tempo of the album A Token of the Wreckage from Megan Slankard finally slows down a bit. Not that you are actually anticipating that; it’s just that the pace and intensity of the first few tracks couldn’t last for an entire album. What results is a song with a rather sad disposition called “The Tragic Life of Caleb”. The song plays like a note to a special someone as the writer contemplates her own life and what will happen after it ends. “The Tragic Life of Caleb” feels like an open letter to someone who has yet to respond. “My Obsession with Bees” is one of the songs on the album that truly stands out. The Rock and Roll that appears on the track is both strong and laid-back at the very same time. The music of the song contains one of the most beautiful guitar parts on the release. The guitar solo will really pull you in. And the entire track is one of the most infectious songs on the album. While much of the album entitled A Token of the Wreckage from Megan Slankard contains songs that feel as if they are very personal it is on the track “The Happy Birthday” that you start to consider what Megan Slankard’s music would sound like if someone else would record it. “The Happy Birthday” is one track that deserves to gain radio airplay, no matter if Slankard is the artist being played or if someone else ends up taking a shot at recording the tune. In fact, The steel guitar and mandolin on the version of the song that appears on the A Token of the Wreckage album give the song a definite folk feel to it. The song has enough of a folk music style to it that it would lend itself well to the playing of Allison Krauss and Union Station. The album returns to a more rock feel with the song “The Pain of Growing Up”. The song about living your life while trying to hold onto your dreams is something that everyone can relate to, no matter how old you are. “You and Your Bright Ideas” comes late in the album, though that just proves how strong the album is when a song this strong has to be placed second from last in the playlist. The electric guitar solo plus the vocal solo on the track both add a lot of texture to the track. The song is one of the strongest tracks on the album and it gives you a nice reward for listening to the whole album. A Token of the Wreckage, the newest album from Megan Slankard, has many songs that will catch your ear. The album will also make you look at her music and her ability to create that music. The release will leave you pondering the independent music scene and will make you wonder why more artists like Megan Slankard haven’t made it in the music industry yet. Check out the video to “A Token of the Wreckage” HERE. Megan Slankard is the real deal! I have had several house concerts with her and everyone loves this beautiful songbird! She is mezmorizing…a true musician/songwriter and a delightful showgirl! Don't miss her when she comes to your town!